Time is the most precious commodity we possess. These words of advice have been somewhere in the back of my mind for awhile, but they didn't genuinely register until earlier this year. The way we spend our time is an expression of what we find truly important. Is the way I am spending my time a reflection of who I want to be? In school this week, the students were tasked with filling in a pie chart of their daily routine, marking how much of their time is spent on various activities. How much time do you spend on your phone? In front of the television? On sports or hobbies? After filling in the charts, they were given a second pie chart. What do you wish it looked like? Even though the lesson wasn't meant for me, the changes have been on my mind since. I would call my parents more, just to talk about the mundane details of day-to-day life. I would take a few minutes each day to clean up after myself. I would give each of my students my undivided attention. I would spend less time sitting on the couch. I would spend more time in the kitchen, enjoying the feeling of dough beneath my fingers. 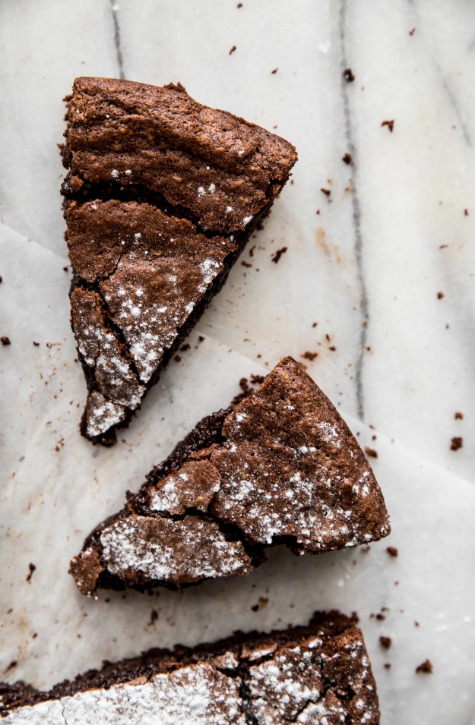 This chocolate almond cake was the result of a chocolate craving that couldn't be curbed. With a deep chocolate flavor, it is well suited for the chocolate lover in your life. I prefer to heat each slice for 15 seconds in the microwave before serving. When heated, the warm cake takes on a gooey texture reminiscent of fudge brownies and cookies fresh from the oven. As a bonus, the cake is naturally gluten-free. This gluten-free Chocolate Almond Cake relies on almond flour to hold it together and give the cake texture. Dark, semi-sweet, or milk chocolate acts as a base for the cake—follow your preference here. Several eggs are used, which help to set it up similar to a thick custard. Serve for the chocolate lover in your life (especially if that person happens to be you). Preheat oven to 350 degrees F (180 degrees C). Grease a 9-inch cake pan and set aside. In a medium bowl, whisk together the melted butter, melted chocolate, 4 egg yolks, espresso powder, vanilla, and salt until uniform. Set aside. Transfer batter to the prepared pan and bake for 25-30 minutes, or until the middle of the cake barely wiggles. Take care not to over-bake the cake or it will be dry. Before serving, sprinkle with powdered sugar. I prefer to heat each slice in the microwave for 15 seconds until the cake is warm and gooey. You'll want to do this too. One of my coworkers has celiac disease, an autoimmune disorder caused by gluten intolerance. Whenever I bring treats to the office after a weekend of baking, she is unable to enjoy them. I am too nervous to make her anything special out of my own kitchen, however. A fine layer of flour has settled over every surface and I am not careful enough to avoid cross contamination when filling measuring cups and spoons. As someone who also suffers from food allergies—mainly tree nuts and dairy—I know how awful (and life-threatening) it can be when someone else isn't attentive enough. So I send her recipes instead, gluten-free inventions from my kitchen that she can create in her own. Though I adore my (gluten-free) almond butter chocolate chip cookies from a couple years ago, I wanted to create a recipe that was more accessible. Almond butter is not only expensive, but it can be difficult to find. Peanut butter, on the other hand, is abundant and cheap. Figuring out the proportions of ingredients was the tricky part. Even though I would consider myself a fairly prolific baker, I have a terrible habit of not reading recipe directions (this is especially true if the recipe is one of my own). As a place to begin, I planned to mimic the proportions of the almond butter cookie. The first batch of cookies was nearly perfect, but I realized, after eating my third cookie, that none of my ratios were as intended. The second batch, following my original directions, turned out worse than the first. Sandy and crumbly, they reminded me more of shortbread than a gooey chocolate chip cookie. My lack of recipe literacy has been helpful before (especially with these double chocolate brownies) and this time was no exception. The third batch improved on the first batch, and the recipe was complete. I tried the recipe with the standard processed peanut butters ("Natural Jif" and "Natural Skippy") and the recipe turned out well both times. Though you can use a completely natural nut butter, I would hesitate doing so. These butters tend to create a more oily batter, which causes the cookies to spread differently (either too thin or not enough). I shared the heaping pile of cookies I created with my teenage students, and this recipe came out the clear winner. The cookie is chewy, gooey, and full of melted chocolate. The fact that it is also gluten-free is just the icing on the cake. These (gluten-free) Peanut Butter Chocolate Chunk cookies are easily my favorite peanut butter and chocolate cookie combination. The texture is thick and dense. Brown sugar adds a chewiness that appears once the cookies have cooled. Combined with chocolate chunks, these cookies could rival any similar cookie, gluten-free or not. Serve these with milk or coffee and dessert will become something special. In a medium mixing bowl, mix together the peanut butter, brown sugar, egg, and vanilla until uniform. Stir in the baking soda and salt. Fold in the coarsely chopped chocolate. Drop cookies by the tablespoon onto a baking sheet and bake for 8-10 minutes. Cool on the baking sheet for several minutes before moving to a cooling rack to cool completely (the cookies will be fragile and need to set-up before they can be moved).